As usual, I bought the fish that was on sale at Earth Fare for our Friday Lenten dinner. This week it was Scottish salmon. Fasting is so difficult… I wanted to make sure that I didn’t over cook the salmon, although if life gives you well done salmon, make salmon cakes! 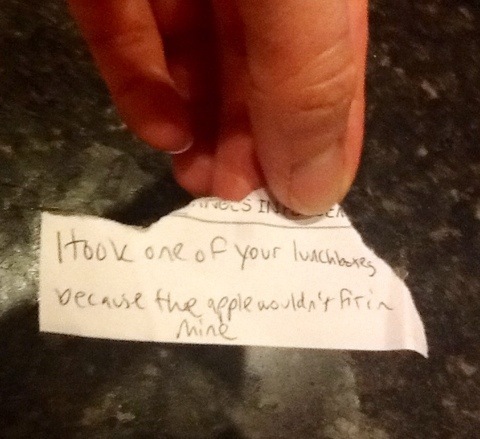 I found this note stuck into the corner of my iPad. 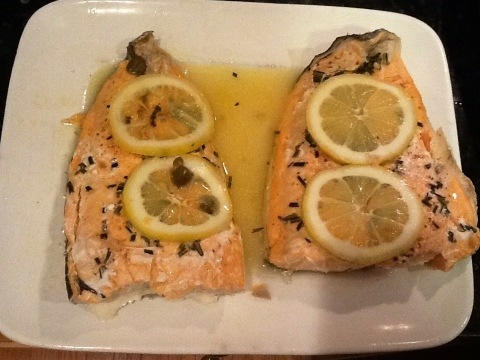 I decided against the George Foreman grill in favor of a baked recipe, but I found surprisingly few baked salmon recipes. 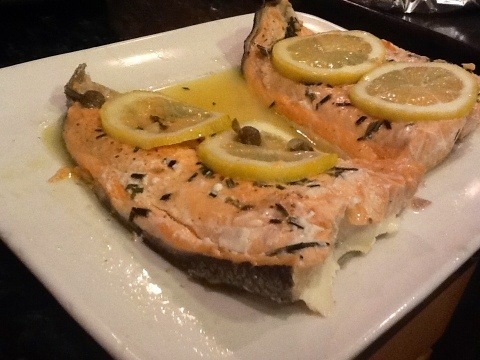 I found this recipe for Salmon with Lemon, Capers and Rosemary, which calls for grilling the fish, but someone noted in the comments that they baked it and it turned out well. I lured Tom into helping by pointing out that it was a “no clean-up” recipe. 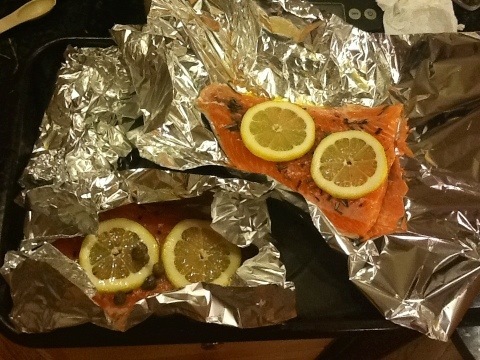 Place each fillet on a piece of aluminum foil, brush each side with olive oil and sprinkle with salt, pepper and rosemary. Tom and I had a sort of assembly line going. 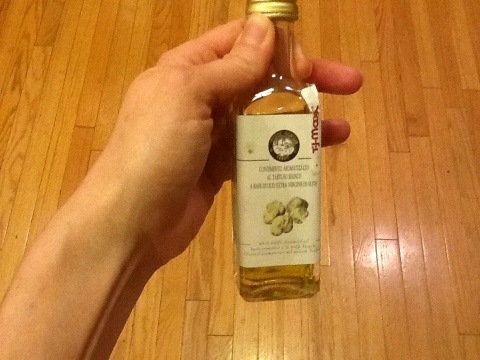 I used a truffle-flavored oil that is really delicious. Yes, I sometimes shop at TJ Maxx . It’s fun to look at their oddball gourmet foods. I don’t have the patience to shop there for clothes. 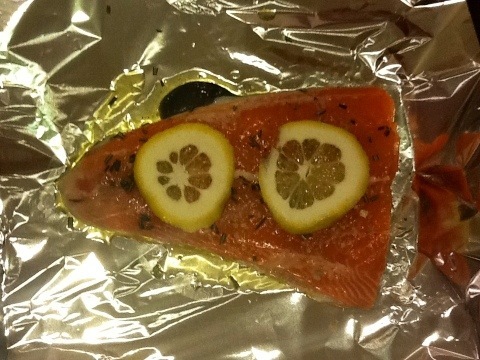 Top each piece of fish with 2 lemon slices. Add capers and drizzle each fillet with lemon juice and apple juice or wine. Seal the foil packets up. 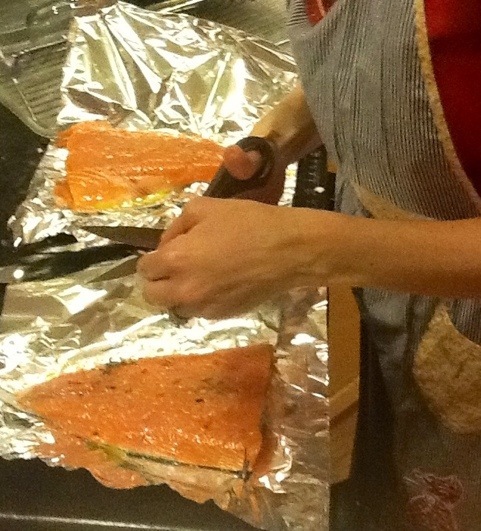 The recipe said to cook for 25 min, so I started checking the fish at 15 min, much to Tom’s amusement. It was done at 22 min. 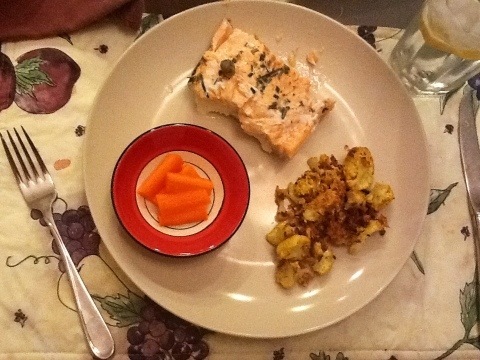 Jewel called the leftover beet greens, so I ate the salmon with curried cauliflower and carrot sticks.